Heather Ackroyd (HA) and Dan Harvey (DH) work together as Ackroyd and Harvey. Sculpture, photography, architecture, ecology and biology are some of the disciplines that intersect in their work, revealing an intrinsic bias towards process and event. 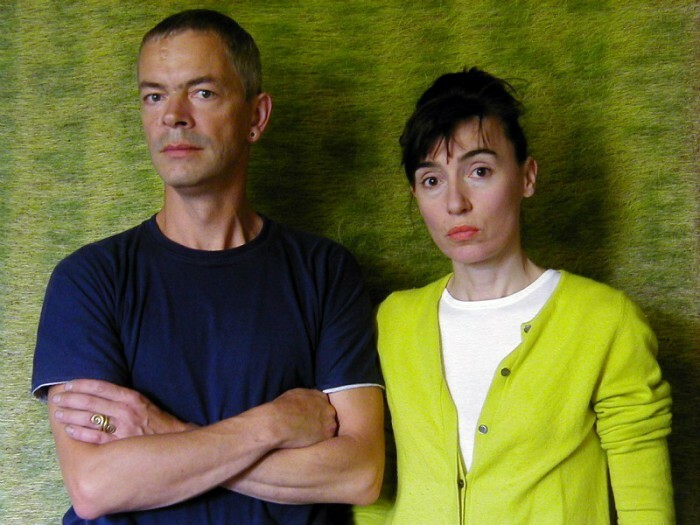 For over 25 years their work has been exhibited in contemporary art galleries, museums and public spaces worldwide. They are also one of the contributors to Lucy Neal’s book ‘Playing for Time’, and active members of Transition Dorking. I started by asking them what, for them, is “art”? HA: In a way now it’s become a way of life. As a way for people to get a handle on what we do we say we’re artists, but sometimes it will be the question “do you paint?” Or depending on who you’re having the conversation with, people by and large now say “what kind of art do you do?” Usually at this point, we bring out some postcards that we have lurking in our bags because working with visual media as we do, it just seems easier to say “ok, this is an example of what we do”. That then allows people to go “oh, right, ok”. Then they start to ask questions. DA: Because our work doesn’t naturally fall into a category; it’s not painting, it’s not sculpture as such, it has its own life energy. So it’s quite difficult to explain what we do, but it is in very much a visual language. HA: Well you’ve managed to explain it to me after about 24 years! In your section for Lucy Neal’s book ‘Playing for Time’ you write about “energising the creative response to climate change”. What does that creative response to climate change look like, and why do we need one? HA: I don’t think there is one singular way that we respond to it. Going back to the point that Dan and I first met back in 1990, the medium of our work was actually chlorophyll, working with seedling grass, using seedling grass grown in a clay base, growing vertically over an existing architectural structure. That was our point of connection. We were talking about processes of growth, processes of change, processes of transformation. In a way, whenever you are dealing with processes of growth, you have to also embrace the inevitability of decay or of degradation as well. So we’ve always been interested in these pivotal points. Put it this way: we would never actually say “this is climate change”. That doesn’t sit comfortably with us at all. We don’t like that bald categorisation of what we do. DH: I think as artists, you work with things that interest you and intrigue you, and sometimes maybe things that you don’t understand as well. With one of the materials, working with the seedling grass the way we do and talking about chlorophyll and photosynthesis, in some ways it is the photosynthesis that has changed the climate, having created a climate that we can actually survive in. So it’s quite interesting, the way that works, starting to move into looking at the environment that we exist within. Can you tell us a bit about some of your work, some of your projects? HA: One aspect, just to pick up on what Dan was saying about the chlorophyll is that we make these very complex biochemical photographs working with chlorophyll as a light sensitive pigment so we can make these incredibly complex images that grown on the vertical we’ll often make the space into the dark room. 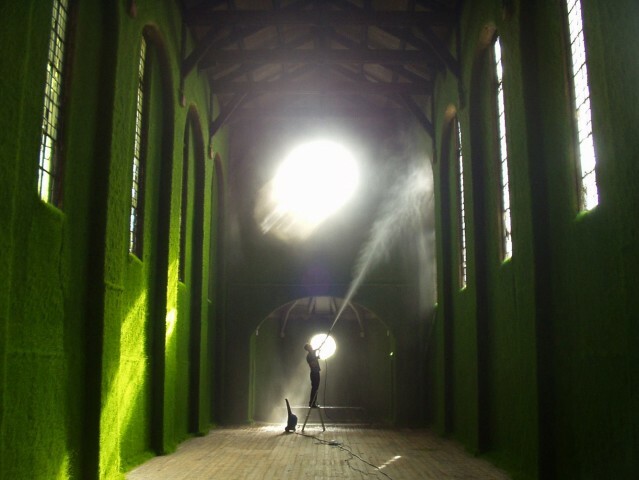 The images are taken by ourselves, that we’ll project onto a wall of growing grass. And then within about 8-10 days, we have an incredibly detailed and very exquisite positive image. DA: The only space that these species receive are from a projected negative onto them, so where the light falls it produces the chlorophyll and goes dark green, where there’s less light is goes less green. Where there’s no light, they grow but they stay yellow. HA: These are pieces of work that we’ve been doing for about 24 years now. 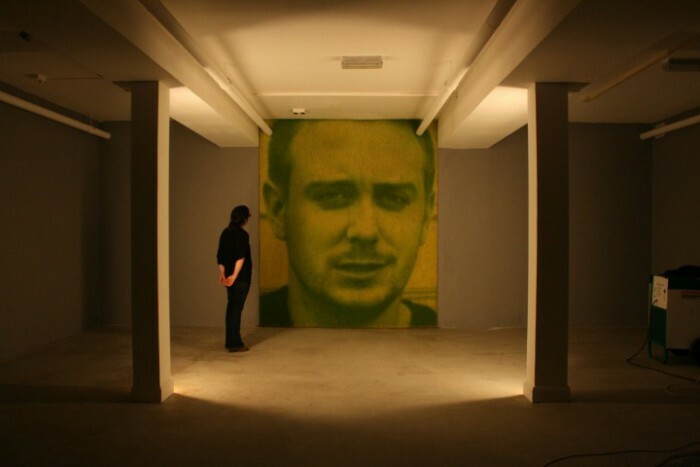 Specifically a project that we initiated in 2007 which we called ‘Beuys’ Acorns’. There is a very famous artist who died in 1986, Joseph Beuys, a German artist. He had incredible worldwide fame and he became very articulate and very passionate about ecology, about the environment, about nature. He actually was one of the founder members of the German Green Party. He got out of politics when he realised how toxic it was on some levels, but he could bring his fame and he could bring a lot of leverage to subjects. If you look at the way that Germany is now in terms of renewable energy, in terms of how it manages energy, how it’s managing the whole debate around climate change, it really is far in advance of where we are, where we seem to be at times almost Medieval wanting to go into fracking. He did an amazing piece of work called ‘Seven Thousand Oaks’. He didn’t complete the project before he died, planting seven thousand trees. We collected acorns from a number of the trees and we’ve been growing them, we have about 200 surviving saplings. For the last few years, we’ve exhibited them in some high profile galleries and venues. 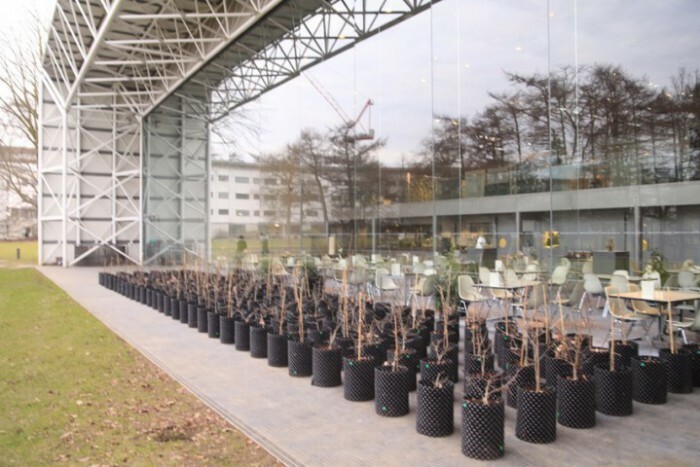 We’ve also done some high profile events, for example the Nobel Laureate Symposium and we’re trying at the moment to get a major project in Paris happening to coincide with COP 21 which is based around tree planting, but it’s also about planting ideas, very multi-disciplinary, visions for now, visions for the future, which will place ecological and social biodiversity into a framework which is mutually beneficial, and will allow evolution that isn’t going to put us into boiling water. DH: We got involved with a project ‘Cape Farewell’ in 2003 that was taking artists, musicians, writers and scientists on a very small sailing schooner into the High Arctic, and experiencing, seeing the changes that were taking place there. We were lucky enough to be involved over a number of years – the last trip was in 2007. But in that time actually really physically seeing the glaciers retreating, but also having scientists on hand, oceanographers and people to speak with, I think that stimulated a number of pieces of work. 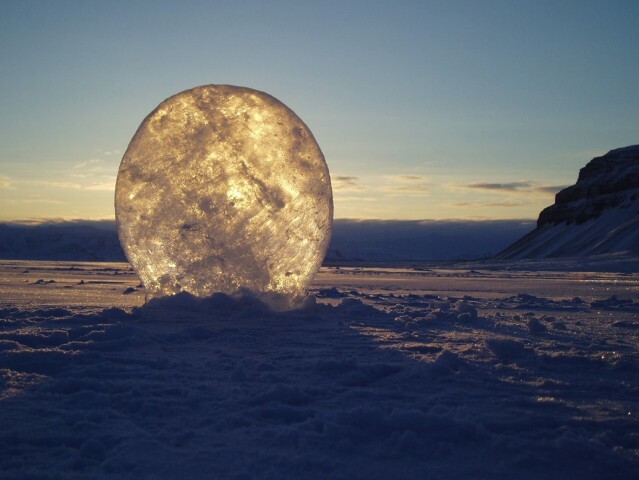 DH: There was a big lens that we carved out of a section of glacial ice. The idea was to get it to focus the sunlight to melt or burn things. Unfortunately, the warmest it got at that time was -27 and the ice just kept on glazing over and frosting and cracking, so we never really got it to focus the light, but it acted as a sort of sun catcher anyway. There was another piece we did, ‘Stranded’ where we managed to access the skeleton of a stranded whale that was washed up in Skegness through the Natural History Museum. 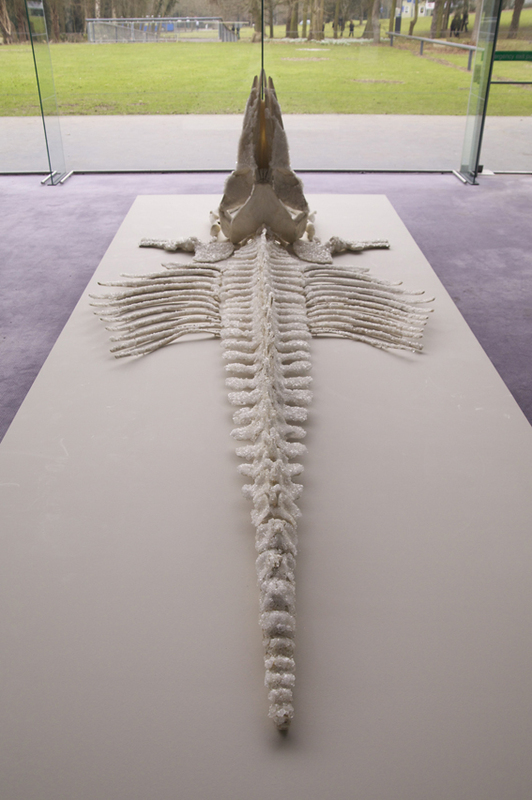 We fenced it on the beach, took the bones out and crystallised the whole piece, the idea was talking with oceanographers about changes in the chemical balance within the oceans that are directly affecting corals but also the plankton that the whales live on. So it was a piece that speaks directly with that. ‘The Polar Bear Diamond’ was another. HA: We sometimes say that there’s an orchestration of responses that we have. It has very much grown out of our body of work. It’s very embedded in the way that we think about natural processes of growth and inorganic processes of growth such as crystals. Some of the earlier work we’re doing in some ways was drawing some really important science that’s been done in this country to show how critically important it is to plant more trees, have green roofs, have more parks in our urban and city spaces to counteract the effects of the heat island effect and warming temperatures and flooding and storms. We’re trying to get to the point where we’re trying to physically engage with people I suppose in more of an aesthetic than an activist role. RH: And what’s your sense of the role that the Arts can play in Transition? Why does Transition need the Arts and then as an extension from that, why does the Arts need Transition? HA: We all need art in our lives, whether it’s in the broader sense: music, writing, paintings, sculptures, beautiful aesthetic designs. Creativity should be almost welded into our beings, and whether or not one is an engineer or a physicist; the people I often find the most exciting are from very different disciplines. Lawyers have such an embedded creative approach which is also quite critical, and when I say critical I mean there’s a criticality there which is good, and communication skills are really important. It’s about trying to use imagination, use vision, use wit, use insight, use, I don’t know, use inner dreams to navigate our way through these various crises that we find ourselves in. Art has been both a guardian and a guide and an absolute independent presence that has shaped and inspired going back to cave paintings really. Yes, Transition is about getting ourselves off this fossil fuel dependence which is heavily promoted by businesses and corporations who we know historically have done some pretty rotten stuff to stop it advancing as we should do, but it’s also all about how we teach, how we share knowledge, what’s important in our world, what we deserve, what we should be protecting, what we should be embracing and celebrating as well. [Here is the unedited podcast of our conversation]. 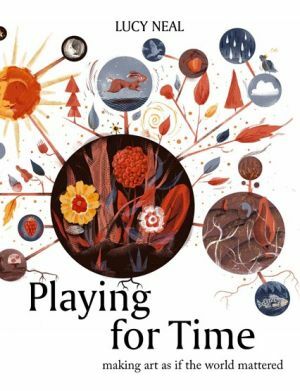 Ackroyd & Harvey are just two of over 60 artists who have written sections for Lucy Neal’s forthcoming book ‘Playing for Time: making art as if the world mattered“ (see cover, right). The book is published at the end of this month. TransitionNetwork.org readers can get £5 off Playing for Time. Simply enter this discount code at oberonbooks.com – ONPFT2015. Valid until 31 Dec 2015.